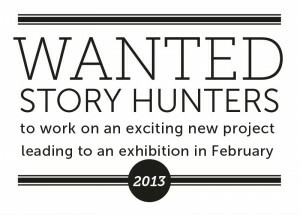 Lancaster Litfest is on the look out for enthusiastic local people with an interest in local history, writing, photography or design and curation to create work for an exciting new exhibition. Litfest has received funding from the Heritage Lottery Fund (HLF) All Our Stories programme to run the Castle Park Stories project, inspiring local residents to uncover the rich treasure trove of stories around the Castle and Quayside. Story hunters will be asked to investigate the hidden histories around a site of their choice with the help of a local historian, a photographer and a writer. They will take part in site visits and workshops and use local archives to undertake research. There are many important locations to choose from in Lancaster’s long and often illustrious history – the Priory, the Castle, the Roman fort remains and the Maritime Museum to name a few. Volunteers can give as much time as they can manage, with opportunities to get involved in the daytime or the evening. Please come along to an initial meeting with project leader Claire Massey at The Storey on Thursday 10th January at either 10.30am or 6.30pm. Please wear suitable footwear as we will be taking a short walk around the Lancaster Castle area. For further information or to register your interest, please contact Claire on 01524 62166 or email claire.massey@litfest.org.